– this is not 2007 all over again! - The $A has been pushed higher lately by a weaker $US, a rebound in commodity prices and technical considerations. - The rising $A is a significant risk for the Australian economy and will constrain growth and keep inflation below target for longer. - While the $A could still go higher in the short term, it is likely to break back down at some point in the next year as the $US bounces back, upside to commodity prices is limited and the interest rate differential in favour of then $A is likely to narrow as the Fed hikes and the RBA holds. Contrary to our expectations, the Australian dollar has recently broken out of the $US0.72 to $US0.78 range of the last 15 months or so on the upside and spiked above $US0.80, its highest in over two years. So what gives? Why has the $A broken higher? Is it an Australian dollar or US dollar story? What will be the impact on the economy? Is it on its way to parity again or will the downtrend resume? Domestic considerations for the Australian dollar have recently been contradictory. While readings for employment, business confidence and retail sales have been solid and the minutes from the Reserve Bank of Australia’s (RBA) last board meeting were seen by many as hawkish, consumer confidence remains weak, June quarter inflation data was soft and the RBA has sought to push back against expectations for higher interest rates and in fact indicated that a lower $A “would be helpful”. Rather there have been three main drivers of the recent break higher in Australian dollar: weakness in the US dollar; a rebound in commodity prices including in the iron ore price; and technical conditions, which have seen the break of the top of the $US0.72-0.78 range attracting more buying into the $A so that the rally has taken on a bit of a life of its own. While President Trump has not been as threatening to the global economy as some had feared (eg, no trade war with China or Mexico – at least so far), his presidency has been characterised by a high degree of mayhem with so far no passage of tax reform or infrastructure spending. In fact, he has just had another bad week: Congress has failed to reform or repeal Obamacare; it has imposed new sanctions on Russia, which can’t be eased by him; several senators warned him not to fire Attorney General Jeff Session; the Boy Scouts issued an apology for a speech he gave at a Jamboree; the military baulked at implementing his policy banning transgender people in the military; and his staff turnover accelerated. Australia’s attempt at political mayhem – with “foreigners” taking Aussie politicians jobs! – arguably pales into insignificance. We remain of the view that the Republican-controlled Congress won’t impeach Trump in relation to the Mueller inquiry (into Russian links and other things) and that tax reform will still be passed (as it’s something Republicans agree on and they need a win). However, while none of the mayhem around Trump has had much lasting impact on the US share market, as it’s benefitted from a “Goldilocks”-like combination of good growth and profits but low inflation keeping the Fed friendly, it has weighed on broader sentiment towards the US. Recently, core inflation in the US has fallen back to 1.4% year on year from 1.8% earlier this year and this may slow the Fed with a September rate hike now looking like it will be delayed to December and possibly early next year. All of this – at a time when growth in the rest of the world has proven to be a bit stronger than feared at the start of the year – has clearly weighed on the value of the US dollar. Ultimately we see the $US resuming its upswing as the US economic cycle is more advanced than in most major countries and the Fed is likely to continue monetary tightening with other countries lagging. But returning to the Australian dollar, in a big picture sense it’s not way out of whack with long-term fair value based on relative prices or what is referred to as purchasing power parity. 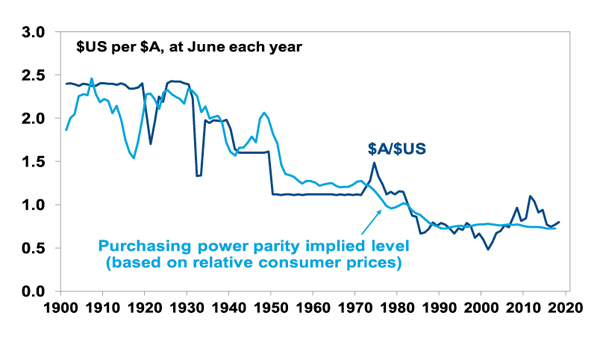 This can be seen in the next chart, which shows where the $A should have been over time if it had moved to equilibrate relative consumer price levels between the US and Australia. Right now, fair value on this measure is around $US0.75, so at around $US0.80 it’s hard to get too excited given that purchasing power parity is only a rough guide. Australia’s export prices were surging on the back of 10% plus growth in China, with Chinese fixed asset investment growing around 25% per annum (pa) and industrial production growing at around 15% pa. The supply of commodities was constrained by years of underinvestment in new mines and related infrastructure. The Australian economy was growing at 5% year on year and underlying inflation was 2.8% and on its way to 5%. So the RBA was raising interest rates in response at a time when US interest rates had peaked (in the very early stages of the GFC), such that the interest rate differential between Australia and the US was widening, which is normally positive for the Australian dollar. Notwithstanding the yoyo ride in the iron ore price, the upside in commodity prices is limited by slower growth in China (with GDP growth running around 6.5-7%, fixed asset investment growing around 8.5% pa and industrial production growing around 7.5% pa). The supply of commodities has surged after record levels of investment in new mines and energy projects. The Australian economy is growing at less than 2% year on year. In fact, the rise in the $A is a problem for the economy and is likely contributing to the underperformance of the Australian share market this year (it’s up 1.4% year to date) compared to global shares (which are up 9.2%). With mining investment still falling, consumers under pressure and housing construction looking like it is peaking, we need a contribution to growth from trade-exposed sectors like tourism, higher education, manufacturing and farming but a rising $A will work against that. Any tourist operator who was thinking of expanding must now be fearing another run to parity is on the way, which will destroy the flow of foreign tourists and send locals back to Disneyland for their holidays. So it won’t be good for investment either. Inflation is running below the RBA’s 2-3% target, and wages growth – the main driver of costs – is at record lows. And the rise in the $A at a time of already sub-par growth risks keeping inflation below target for longer. As a result, the RBA is far from tightening. In fact, in its post- August meeting statement it noted that a rising $A “would be expected to result in a slower pick-up in economic activity and inflation than currently forecast”. 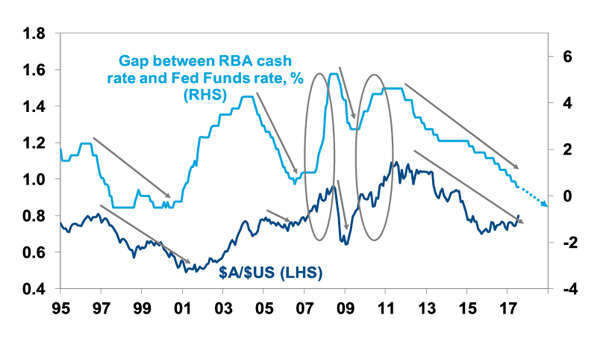 In other words, the rising $A is a defacto monetary tightening that will mean a lower profile for the cash rate than would otherwise have been the case. And meanwhile with US economic indicators remaining solid the Fed is likely to continue raising rates and start reversing quantitative easing next month. So a resumption of the falling interest rate differential between Australia and the US is likely. As the next chart shows, periods of a falling official interest rate differential between Australia and the US usually see a falling Australian dollar (see black arrows) – not in a straight line, but over time. By contrast surges in the value of the $A (eg 2007-2008 and 2009-2011 – both circled) are associated with rising rates in Australia relative to the US and there is no sign of that. The huge difference between the Australian and US economies at present can be seen in broad measures of labour market underutilisation. 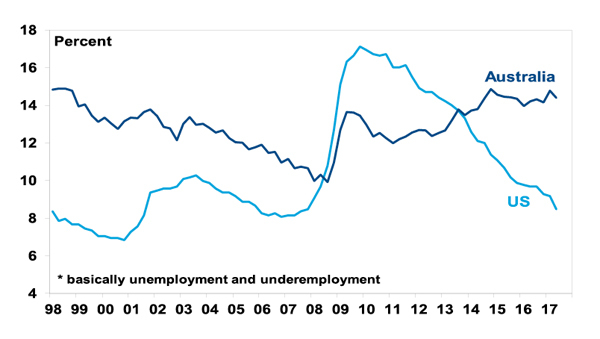 In Australia, the combination of unemployment and underemployment is about as high as it ever gets, whereas in the US its nearing as low as it ever gets, which is consistent with falling interest rates in Australia relative to the US. Back in 2007, when the $A was on its way towards parity, the Australian labour market was rapidly tightening with labour market underutilisation heading to a record low. In the short term, the $A could still have more upside as the break up through key points of technical resistance could still attract more buying into it. But this is not 2007 and in fact is very different. The decade-long commodity price boom is long gone and the Australian economy is underperforming. So I remain of the view that at some point in the next year the $A will fall back – probably below $US0.70 – but trying to get a handle on when that will be and from what level is not so easy. For investors, this means there remains a strong case to maintain a decent exposure to offshore assets that are not hedged back to Australian dollars as they will go up in value if the $A falls. This has the added advantage that if we go through another global growth scare, which will invariably weigh on the $A, it will provide a useful hedge for Australia-based investors.